Although it now has become synonymous with the NCAA Division I Men’s Basketball Tournament, the phrase “March Madness” was coined here in Illinois. 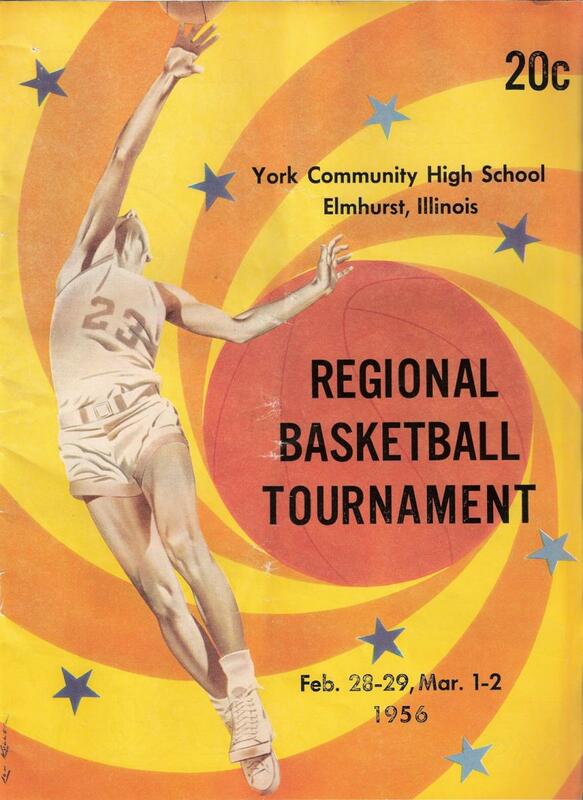 For almost 50 years it was associated exclusively with the Illinois High School Association Boy’s Basketball Tournament. The very first IHSA Boy’s Basketball Tournament was held here in Oak Park in 1908. The creation of Lewis Omer, Athletic Director at Oak Park and River Forest High School, it is generally considered to be the first high school state tournament in the nation and it became a model for state high school tournaments across the country. The NCAA Division I Men’s Basketball Tournament is perhaps the most popular sporting event in the United States and it is universally known by its nickname: March Madness. That nickname is so closely connected (and so valuable) to the NCAA that its commercial use is now protected by trademark. But the phrase “March Madness” was first connected to basketball in Illinois, and the event that inspired the phrase started in Oak Park. In the early years of the 20th century, high school basketball was gaining popularity rapidly throughout the United States and especially in the Midwest. Requiring only 5 players and minimal equipment, basketball was the most egalitarian of team sports. Virtually any school—large or small, rich or poor-- could field a team. The high school basketball team played an important role in community life, both as an inexpensive entertainment that brought communities together and as a source of civic pride. And, at the end of each high school basketball season, a dozen or more towns would declare their basketball team the best in the state. In 1907, a young mathematics teacher named Lewis Omer was appointed athletic director of Oak Park and River Forest High School. Omer, himself a basketball player and fan from a small town in rural Illinois, had an idea. Why not have an invitational tournament at the end of the regular season featuring the best teams in the state to determine an official Illinois State Champion? Omer contacted principals and athletic directors from schools throughout Illinois, but his notion of a championship tournament initially did not get much support. Many schools didn’t even bother to respond to him. But he did gather enough allies to warrant continuing the pursuit of his idea. Over the Christmas holiday in 1907, Omer traveled to Springfield to present his plan to the Illinois High School Athletic Association, the forerunner of today’s IHSA. The Association, though skeptical that there would be much public interest, agreed to sanction the tournament and declare the winner the Illinois State Champion, but only on the condition that Omer organize it himself and that there be no cost or liability to the Association. Looking back, it is amazing how quickly Lewis Omer was able to put his tournament together. He and H. E. Brown, his greatest ally and the athletic director and basketball coach at Rock Island High School, agreed to personally cover any financial loss incurred. He convinced the Oak Park and River Forest High School Athletic Association to underwrite some of the expenses. He put together a committee consisting of himself, Clarence Phelps of East Aurora High School, and M. J. Newell of Evanston High School to select the participating teams and administer the event. He arranged for the Oak Park YMCA to be the venue for some of the games since their facility was larger than the high school gymnasium and could accommodate more spectators. He arranged for volunteer referees from the YMCA to officiate the games, some of them coming from as far away as Bloomington. He set up volunteer committees to handle ticket sales, to serve as guides for the visiting teams, to arrange housing for the visiting players and coaches, and to host a tournament reception event. The tournament was held over two full days, Friday March 27 and Saturday March 28, 1908, and it was a rousing success. Participating were the high school teams from Oak Park-River Forest, Rock Island, Hinsdale, Riverside, St. Charles, Geneva, Washington, Evanston, Wheaton, Mt. Carroll, La Salle, and Peoria. West Aurora and Joliet were supposed to participate but did not appear. The Chicago Public School League was also invited to send two teams, but refused the offer. Peoria won that first tournament, with Rock Island finishing second, Oak Park-River Forest third, and Hinsdale fourth. OPRF would not have another top-ten team until its 4th place finish in 1956. Much to the surprise of the Illinois High School Athletic Association—and to almost everyone other than Lewis Omer-- the tournament actually generated enough revenue to recoup the personal expenses he and H. E. Brown had incurred, to pay back the OPRF High School Athletic Association, and to return a modest profit to the Illinois High School Athletic Association as the sanctioning body. Lewis Omer had just created the first state championship tournament in the United States. It became a model that other states would soon follow. The next year the basketball tournament was held at Bloomington High School and the Bloomington YMCA. This time the IHSAA took full fiscal responsibility and control of selecting teams for the tournament. They had the good sense, however, to retain Lewis Omer as Tournament Director. Over the next few years the tournament continued to grow until, by 1920, it was the largest single source of income for the IHSAA, a position it retains to this day. In 1922, the format was changed from an invitational tournament to a single elimination playoff among the winners of district tournaments throughout the state. This made the tournament even more popular because even the smallest school could “play their way in” and get statewide recognition. The tournament continued to grow in popularity and to generate more excitement with each passing year. In 1939, Henry V. Porter was writing an article about the upcoming basketball tournament for the IHSA magazine. Trying to explain and justify the fervor and frenzy that had grown around the tournament, he wrote, “A little March madness may complement and contribute to sanity and help keep society on an even keel.” The phrase “March Madness” took on a life of its own and quickly became identified with the Illinois High School Basketball Tournament. But, while nearly everyone in Illinois knew what March Madness meant, the term was virtually unknown outside of the state. That is, until 1982. Brent Musburger had worked in Chicago for several years in the 1960s and 1970s, first as a writer for the Chicago American newspaper and later as a sportscaster at CBS affiliate WBBM-TV. He was very familiar with Illinois’ March Madness and all that it meant. In 1982, while anchoring CBS’s network coverage of the NCAA Men’s Basketball Tournament, Musburger repeatedly used the phrase “March Madness” to describe the NCAA Tournament. It caught the public imagination and almost overnight March Madness came to mean the NCAA Tournament in the mind of most Americans. In the late 1980s, the NCAA began licensing the name March Madness and tried to block the IHSA from using it. The IHSA, which had been using the term for 50 years, naturally objected. After much legal wrangling the IHSA and NCAA reached a settlement and today trademark use of the name “March Madness” is held jointly by the IHSA and the NCAA. And what of the man who created the tournament that begot the phrase that became a synonym for post-season college basketball? Lewis Omer left Oak Park in 1910 to become the athletic director at Evanston Academy. He served in that capacity until World War I. When the United States entered the war, Omer joined the army where he rose to the rank of major, in charge of “physical conditioning and bayonet training” at Camp Douglas. After the war he returned to his boyhood home and ran his family’s farm near Clayton, Illinois. In 1921, he accepted the position of Athletic Director and Head Football Coach at Carthage College, which, at that time, was located in nearby Carthage, Illinois. He retired from coaching in 1935 but stayed on at Carthage College and returned to his first career: teaching mathematics. He served as a mathematics instructor at Carthage College for more than a decade. Lewis Omer passed away in January 1954 at age 77 and was buried in the village cemetery in Clayton, Illinois, the town where he first fell in love with basketball. The Oak Park and River Forest High School team reached the “Final Four” three times, finishing 3rd in 1908, 4th in 1956, and 3rd in 1976. You can read more about our connection to “March Madness” and the Oak Park and River Forest High School “Final Four” teams, by clicking the links below.